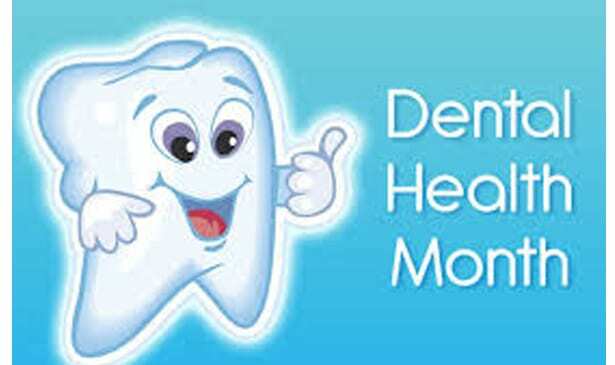 October is National Dental Hygiene month and this Tooth Talk article will give you a few tips to help you maintain a healthy smile. Keeping your teeth healthy is very important to help you to be able to chew food, help with pronunciation of words, and helps maintain the contours of your face. There are simple steps to help keep your teeth strong from childhood to your later years as an adult. • Brush Twice a Day with a soft bristled toothbrush for 2 minutes to help remove plaque and bacteria from your teeth and gums. • Brush Your Tongue to remove bacteria and keep your breath fresh. • Floss Your Teeth daily to remove plaque and food from between your teeth. • Use a Fluoride Toothpaste which will help to strengthen the enamel making your teeth more resistant to decay. • Drink Plenty of Water helps to flush your teeth clean and discourages tooth decay. • Get Dental Treatment completed in a timely manner because dental problems never correct themselves on their own. Going to the dentist is very important to keeping your teeth healthy. Routine checkups every six months help to promote good oral health as well as screen for health conditions such as oral cancer and high blood pressure.